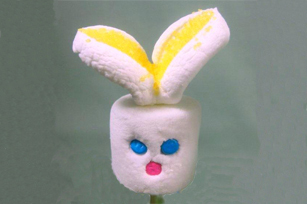 These Wascally Wabbit marshmallow treats couldn't be cuter—or easier to put together. Cut 1 marshmallow crosswise in half with kitchen shears. Partially cut each marshmallow half in half again, being careful to not cut all the way through to opposite side of marshmallow. Dip cut sides of marshmallows in sugar. Poke 3 holes in each of the remaining whole marshmallows for the bunny's eyes and nose. Press candies into holes. Insert wooden skewer through bottom of each whole marshmallow until end extends about 1/4 inch over top of marshmallow. Add ears to each bunny's head, gently pressing into end of skewer to secure. Cut 3 marshmallows crosswise in half. Dip cut sides in yellow colored sugar. Cut small wedge off rounded edge of each marshmallow half. Thread 2 halves onto each of 3 skewers, placing cut edges together to make each chick. Press 2 candy corn pieces between marshmallow halves for the wings. Add 6 colored chips for the eyes. Cut white tips off 3 additional candy corn pieces. Press into the chicks' faces for the beaks.